The Ogle journey begins. Set up by David Ogle after leaving Murphy Radio. The new company’s first major client was Bush Radio, who commissioned Ogle to design two products: the TR82 radio and the SRP31D record player. In 1959, David made the decision to move into larger premises. Ogle arrive at a new home in Letchworth Garden City, where you can still find us today. Having initially gained a reputation for our work with small-scale consumer goods, the business made the move into car and transport design and limited car production for a short time, having been approached by the Electricity Council in 1960 to devise a study that investigated the possibility of electrically powered taxi. The Ogle Mini soon followed; an innovative two-seater modelled on the then-new BMC Mini. Following David’s untimely death, John Ogier, a car enthusiast and investor, took over as Ogle’s Chairman, with Tom Karen becoming Managing Director and Carl Olsen joining the team as senior product designer. As our reputation for product design grew, so did our customer base. By 1965, the total workforce had grown to 28. One of the biggest projects of the year was with Reliant, with Ogle tasked to redesign a number of the company’s sports cars as well as looking into developing and expanding a range of Reliant concepts. Our work within the automotive industry continued, producing the new Bond Bug for Reliant in 1970, widely-viewed as one of the most original designs of the decade. Away from vehicle design, we were asked to design a range of toys for Meccano; featuring fire engines, military vehicles and toy Mogulwagens. Following on from the Bond Bug, we produced another production vehicle in 1972 in the shape of the Robin, going on to create a high-performance GT couple named ‘Sotheby Special’. As well as cars, the early 1970’s also saw the birth of our Transcontinental cab; a specially-designed and equipped truck cab allowing drivers to undertake intercontinental runs – something that hadn’t been done before in Europe. With a taskforce now totalling 40 designers and model-makers, our work within the automotive industry now saw the company produce the Lucas Electric Taxi; one of the first electric cars. As well as electric cars, it was at this time that the team were also working on innovative digital alarm clocks as well as record players. Now an established name in the world of automotive design, we were approached by makers of a new motion picture titled ‘Star Wars – A New Hope’ to work on a model of Luke Skywalker’s now iconic Landspeeder, as well as the film’s Y-Fighter. With the popularity of caravanning holidays at an all-time high in Britain, we found ourselves commissioned to create a series of successful motor caravans, including the CI Motorhome; Europe’s largest-selling coachbuilt motor caravan, which went on to win the European Motor Caravan of the Year award that same year. 1979 saw us celebrate our 25th anniversary in business. Now boasting a workforce totalling 60, the company’s growing size resulted in a new high eve height, clear-span prototype shop, increasing working space by some 25%. 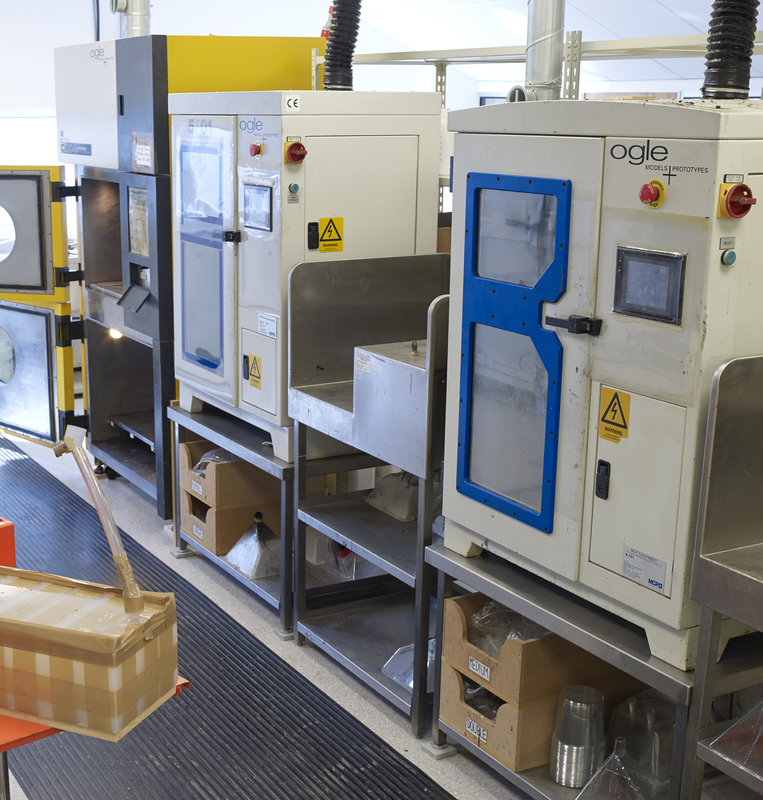 We installed one of the first vacuum casting machines in the UK, giving our clients the opportunity to produce multiple high-quality models and prototypes for a full scope of applications, from form, fit and function prototypes to end use parts. At the beginning of the 1990s, we were tasked with building the largest ever mock-up of the Jetstream 41 plane alongside British Aerospace. 1994 saw us work on a new Harrier Jet cockpit to aid training for the Royal Air Force. The project saw us create an exact replica of the cockpit, allowing the RAP to bring their training into the classroom, cutting costs and improving the overall training offered. Continuing to compete as the leader in the industry, we were one of the UK’s first to embrace Additive SLA technology, which helped drastically reduce lead times and allow us to offer clients complex geometries that could not be manufactured previously. In 2000, we realigned our focus solely on model making and prototyping, selling off the design arm of the company, making sizeable investments in cutting-edge machinery, expanding into a number of new sectors, such as aerospace, architecture, medical and defence. This year also saw us invest in our second 3D printing process - SLS. Not only increasing our capacity, but allowing us to produce more durable prototypes for a wider range of applications. A decade after the arrival of our first SLA machine, we added a further 2 SLS machines to our portfolio, proving our dedication to investing in the very best technology for our clients. 2014 saw us celebrate our 60th birthday. With a dedication to the investment in new technology and a highly skilled in-house team, we are proud to remain an industry leader and one of the most respected names globally. To add to our already expanded selection of machinery, which included three SLS machines and four SLA machines, 2014 saw the arrival of the iPro 8000, giving us the ability to quickly and economically builds parts with unprecedented surface smoothness, feature resolution, edge definition and highly accurate tolerances that can even rival the accuracy of CNC machined parts. Working with ATLAS ELEKTRONIK UK to produce detailed models of their Atlas Remote Capability Integrated Mission Suite (ARCIMS), the next generation remote controlled and autonomous unmanned boat. This year also saw another couple of additions to our portfolio of machinery, including an FDM machine and a large frame Belotti CNC machine, expanding further our capabilities here at Ogle HQ. We produced two aesthetic phones and base chargers as part of the BT DECT cordless telephone portfolio alongside industrial design company The Alloy. There was intricate never-before-seen detailing for the buttons and integrated lighting for the base charger. This project utilised our industrial SLA and CNC machines, with our paint department bringing them to life. It was in 2016 where we linked up with industrial designers Map and Mori Inc and Honda to design seven concept vehicles that could retrace the world’s longest route of human migration from Nairobi, Kenya to Manaus, Brazil as part of Honda’s ‘Great Journey’ project. We gifted ourselves a state-of-the-art piece of equipment to speed up production. The Hurco VM30i 3 axis machining centre increased our CNC capability and increased the amount of in-house CNC machines to eight, giving customers greater flexibility and, ultimately, faster turnaround times. Working with a team from University College London (UCL), we created a prototype for the Unmanned Aircraft Systems Challenge and helped the students reach the final stages of the major international aerospace competition. We were also very excited to work with a group of Coventry University students ahead of the Formula Student competition, using SLS technology to reduce weight and maintain optimum performance of its single-seat race car. To cap off the year, we installed our largest 3D printer to date, the NEO800. As ever, we are continuing to look to expand our team and technology reach over the next decade. With a skilled team capable of taking on any challenge, we’re very excited to work on some fascinating projects – and we can’t wait to see what the next 60-plus years brings.